← What is it to be Water Sensitive? A picture (or a series of pictures) can tell so much more than words. Here is a link to a stunning example of water sensitive – urban – design: Worldchanging: Bright Green: HafenCity: A Case Study on Future-Adaptive Urban Development. Amanda Reed researched the HafenCity story and posted her ‘visual case study’ on 31 August 2010. 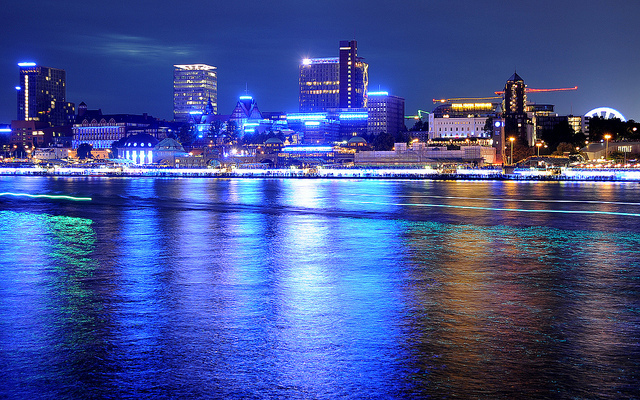 HafenCity, or Harbor City, sits on the river Elbe, in old Hamburg Harbour. This is a city area prone to flooding – and the key for this, one of the largest inner-city rebuilding projects in Europe – is that the project anticipates and to an extent, facilitates, flooding. This is a 157-hectare city district that will eventually see the creation of more than two million square meters of usable building space – or gross floor area (GFA) – and ‘versitile and attractive open spaces’. So far, this WSUD project has been ten years in the making, with a 2020, or even 2030, completion date. I encourage you to take a look at this case study, and think about how your communities could adapt some of the more simple and affordable approaches and lessons from it, if the more large scale engineering feats seem beyond reach of current resources. Seeing water sensitive approaches in action – seeing cities and towns grow more beautiful, more livable, more viable, more exciting – can be a source of inspiration for thinking and action for water sensitive change in our own communities. Intriguing! I immediately started scanning the net to learn more. Since HafenCity is such a large and long standing development project – it features building, bridge, and landscape designs from over 700 architects, including powerhouse names like Rem Koolhaas, Herzog & de Meuron, and Behnisch – it was easy to find well illustrated articles that discuss the development’s architectural projects and overall sustainability features, but coverage of its water adaptation design strategies, with illustrative images, was sparse. This post is an attempt to remedy that lack. By looking through the development’s official website, scouring Flickr, and exploring a selection of the architecture, landscape architecture and engineering firms’ websites, I think I’ve been able to pull together a serviceable attempt at a visual case study of HafenCity’s future-adaptive urban design strategies. Amanda – you’ve done much more than a ‘servicable’ job in pulling together the essential elements of this case-study! See the timeline for the project here – starting December 1996 with Hamburg architect, Professor Volkwin Marg’s, initial study and presentation on redeveloping the inner city fringes of the port. 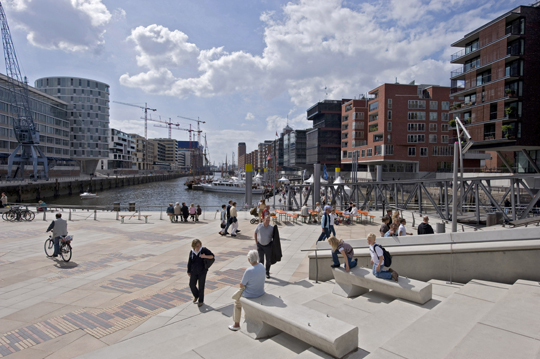 Just five months later, the city’s first Mayor, Henning Voscherau, presented the ambitious HafenCity Vision to regain the waterfront for people. 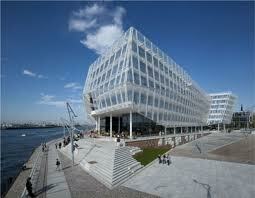 HafenCity Hamburg GmbH or HCH provides integrated management to match the complex requirements of HafenCity as a whole. HCH’s primary functions are to make available, develop, market and sell pieces of land. It is also responsible for communication, relations with the public, event management, publicity and promotion of the arts locally. Processing of zoning plans and construction documentation is concentrated in the Ministry of Urban Development and Environment (BSU), since HafenCity has been classed as a so-called priority area since 2006. For the public built environment, HCH takes on the role of developer itself: it develops infrastructure for the district (e.g. flood-secure roads and bridges) and lays out squares, parks, sport and play areas. HCH guarantees the quality of development in the district by taking on wider controlling functions, such as urban planning and architectural competitions, which it coordinates with the Ministry for Urban Development & Environment and the developers concerned. HCH is owned 100 per cent by the Free and Hanseatic City of Hamburg and is the trustee of its ‘city and port’ fund under public law: almost 100 per cent of land inthe HafenCity project area not yet sold is placed in this special fund. HCH finances its activities through the sale of such pieces of land. HafenCity-GmbH. Am I being overly simplistic when I imagine we could adopt elements of HafenCity’s design into Wellington’s or Porirua’s urban planning? 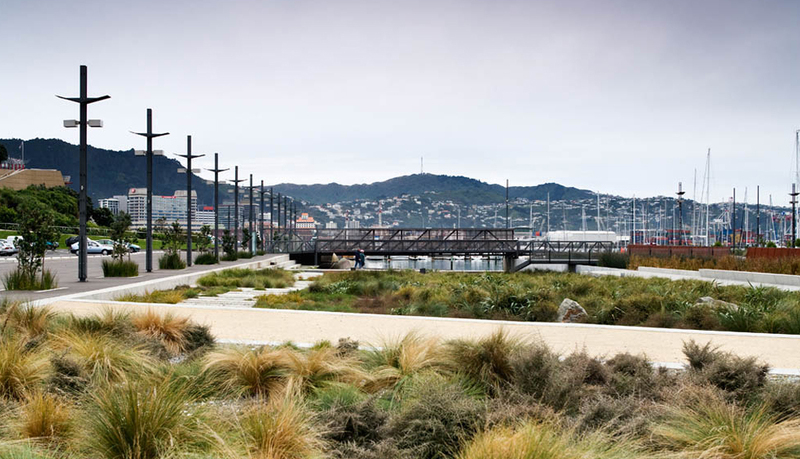 The Megan Wraight designed multifaceted stormwater system that can be seen in action in the harbour area near Te Papa and Wellington’s Oriental Bay – is a starting point – with clever and visually appealing integration of urban form with function. Check out the Waitangi Park story and pictures here. More and more, in Aotearoa, we are doing water sensitive design as if we mean it. Great examples of ‘good design that works’ are out there – like HafenCity – like Doug Avery’s Bonaveree dryland farm (see earlier post) and Megan’s waterfront stormwater design – inspiring us to take the leap and do more to make our places more livable, affordable, more friendly and safe – securing our future. Stories inspire design…links to inspiring water stories are appreciated. This entry was posted in Environment, HafenCity, Porirua, Uncategorized, water and tagged adaptive urban development, HafenCity, Megan Wraight, Old Hamburg Harbour, WSUD. Bookmark the permalink. Viel gepostet. Das ist unverwechselbar. Auch die anderen Postings sind impressive. Ihr Fan.